Do you smell spring in the air? May, not quite yet, but believe it or not, it is right around the corner. Next Wednesday, March 20, marks the beginning of the vernal equinox. The snow is disappearing slowly but surely. February brought in record-breaking amounts of snow. In fact, the city of Wausau set a new personal best with 39.1 inches of accumulation, well exceeding their previous record of 28.4 inches set back in 1964. Understandably, it will take some time to get rid of the snow banks completely, but we are making progress. Mother Nature is celebrating with well-above average temps. Today, we are expected to reach 52 degrees here in Rosholt, which will feel like a treat. But we’ll need to stay tuned because it appears that 50-degree temperatures will become the new normal in the upcoming weeks. The birds are back in town. Sparrows and sandhill cranes are making their way back home, and the robins will get back to their usual routines. The days are getting longer. We may have lost an hour of sleep last week due to Daylight Saving Time, but we are now getting more sunlight. We’re looking forward to seeing a little bit more of our old friend, Mr. Sun. It’s almost time to play ball! The 2019 MLB will open on its earliest day ever. All 30 teams will play on March 28, excluding international openers. The previous earliest opening day was only last year on March 29, 2018. There are many ways to show us that spring is almost here. From now until June 21, 2019, we will be witnesses to the rebirth of the beautiful, Wisconsin landscape. What is your favorite part of the new season? Happy Spring from Lions Pride! Doggone it, the temperature is hot out there! But they don’t call it the Dog Days of Summer for nothing, right? Here at Lions Pride, we thought it would be interesting to find out what this common phrase has to do with man’s best friend. The official Dog Days of Summer take place from July 3 to August 11. Many people assume that the common phrase comes from the sluggish behavior that dogs exhibit during this six-week stretch, but the real meaning comes from astronomy. According to the Farmers’ Almanac, the phrase originated in reference to the fact that at this time, the sun occupies the same region of the sky as Sirius, the brightest star visible from any part of the planet and part of the constellation Canis Major, the Greater Dog. During the summer, the sun rises and sets with Sirius. July 23 is a particularly significant date because the star becomes incredibly bright. In fact, the ancient Romans believe that it acted as an additional heat source, increasing the sun’s warmth. As a result, the Dog Days of Summer came to mean the 20 days before and after Sirius’s alignment with the sun. Of course, this period may very well be the hottest stretch of the summer, but it doesn’t anything to do with the brightest star. The heat of the summer comes from the position of the Earth’s tilt. The tilt of the Earth causes the sun’s rays to hit at a more of a direct angle and a more extended period of time during the summer months in the Northern Hemisphere – meaning hotter, longer days than we experience the rest of the year. We know that miserably hot, muggy days are not always pleasant, but it’s the perfect time to participate in water activities like boating, swimming and relaxing. Remember, we live in Wisconsin, so it won’t be long until there’s snow on the ground. Enjoy the Dog Days of Summer and stay cool out there! Ahh… spring is in the air, right? Well, not quite. Monday may have marked the first day of the vernal equinox, but it doesn’t exactly feel it’s time just yet. Fortunately, there are signs that warmer days are ahead. Spring flowers are beginning to peek through the soil. You may have already seen crocuses, crested irises and hyacinth. We hope they make it through the next few chilly nights. Flowering trees are budding and beginning to show new life. The birds are back and ready to sing their hearts out. Robins, sandhill cranes and song sparrows are becoming old regulars. College basketball has taken over all of the TV stations. There’s a reason why they call it March Madness, but we’ve already made it to the Sweet 16. The days are getting longer. We have lost an hour of sleep on the night of March 11, but we are now getting more sunlight. We can’t wait to spend more time with Mr. Sun! The snow is disappearing. We do not see the large snow banks that we saw only a month ago. Now, all that’s left are the dirty piles on the sides of roads. In many cities, school is out for the week. Our office intern is off and enjoying a much-needed break in Mexico for Spring Break. It’s time to play ball! Baseball season is only a week and a half away. The official MLB 2017 Opening Day is next Monday, April 3. There are so many ways that spring is right around the corner! Now we want to hear from you – what is your favorite sign of spring? In Like a Lion, Out Like a Lamb? We Don’t Think So. Wow, another month has come and gone, and the most unpredictable time of the year has officially arrived. As we write, the all-too-familiar white fluffy snow continues to fall, adding to our fresh piles. It looks like March is coming in like a lion so it will go out like a lamb, right? “If spiders are many and spinning their webs. The spell will soon be dry. But are there are any truths to these sayings? You may be surprised to learn that all of the listed folklores are true, except – you guessed it – our lion and lamb saying. Read through more true weather folklores. We have all experienced Marches that began with wild snowstorms and ended with blue, clear skies, but there are no scientific facts that provide evidence to this being a valid claim. Of course, we can hope that March starts off cloudy and snowy, and then ends with warmth and sun, but the key word is hope. Sadly, this particular lion saying appears to be more of a rhyme than a weather predictor. Fortunately, we can quickly come up with a lion saying that we know for a fact to be true. “Where there’s a need, there’s a Lion.” Each year, Lions like you are making a difference in their communities all over the globe, and we have proof! LCIF recently released their 2015-2016 Annual Report, where they announced that they received over $39.4 million in generous donations. The foundation then awarded 453 grants totaling over $45.2 million to support the work of Lions around the world. These grants made a positive impact on the lives of more than 44 million people. Now, that’s what we’d like to call making a difference! On second thought, “In like a lion… out like a lamb” is obviously a false claim because Lions come in Lions, and come out like Lions, everyday of the year (regardless of the month.) From all of us at Lions Pride, thank you for all that you do and keep up the good work! We have officially entered the third week of the New Year! As any long-time Wisconsinite can attest, January can be tough. We may have started out the year with optimism, but with all of the recent ice storms, it can be difficult to keep that positivity rolling. It just so happens that this is about the time, people start to abandon their resolutions. Enter Healthy Weight Week – an opportunity for all of us to find hope once more. Rather than starting another unhealthy diet or outrageous exercise routine, Healthy Weight Week allows individuals to rethink their New Year’s Resolutions, and start adopting a healthy lifestyle. Find an activity that you enjoy partaking in so you can include it in your daily routine. It should come as no surprise, but when you like what you are doing, you are more likely to form a habit. Learn to focus on the pleasure of the activity and all of the health benefits involved. We don’t need to tell you that high levels of stress can have dangerous repercussions on your life so now is always a great time to take control. Make time for daily 15-minute relaxation sessions or simply empty your mind and let your body go limp for 30-second relaxation breaks throughout the day. By adopting a philosophy of flexibility, relaxing and going with the flow, you’ll be able to tackle the burdens of everyday stress. Due to the normal hustle and bustle of everyday life, many of us are left overindulging and eating at irregular times. Break that habit by eating the three recommended meals of the day, snacking when hungry and then subsequently stopping when full. Although none of these mentioned habits might not seem like large commitments, they are just enough to help us start living a healthier lifestyle. Remember, that small changes create big results. Happy Healthy Weight Week from Lions Pride! It’s the most wonderful time of the year! We’ve officially entered the middle of December, our ground is fully covered in snow, we’re slowly making our way through our shopping lists and likely have dozens of tasks that are in need to completing before the Big Day arrives. Is it just us, or could the most wonderful time of year also be replaced with the most stressful time of the year? After doing a bit of research, it appears that we are not alone in our thinking. According to a poll conducted by the American Psychological Association, nearly a quarter of Americans feel “extreme stress” due to a lack of time, a lack of money or the pressure to give or get presents. One of the biggest challenges of having so many items to tackle is that it is tough to keep them all straight. Make a master list where you have everything from presents to buy, goodies to bake and cards to mail. Often, many of the holiday tasks are assigned to one person in a household. If it just so happens, that you are that person, ask for help. You’ll get back by time by divvying up responsibilities and likely have more fun. Doesn’t enjoying a glass of eggnog while addressing envelopes with a loved one sound more delightful than completing them alone? Before shopping, determine a budget and stay committed to sticking with it. Remember, that money can’t buy happiness; it’s the thought that matters most. If you’re looking for alternatives to store bought gifts, create homemade gifts or donate to a charity in your recipient’s name, Lions Pride comes to mind. Saying yes to too many obligations can leave you feeling overwhelmed, and eventually resentful. Don’t feel like you have to participate in all holiday activities; we guarantee that your loved ones will understand. Although it may sound counterintuitive, remember the importance of rest during times of stress. Make time for yourself. Find an activity that clears your mind. Consider partaking in an activity that you can only do this time of year, like listening to Christmas music or taking a walk and admiring the lights. We all agree that this time of year is definitely a busy one, but don’t let the stress of your To Do list stop you from enjoying the magic of the season. Remember to take a step back and truly think about the reason behind the season and enjoy every moment of the holidays. They will be here and gone before we know it! Happy Holidays from Lions Pride. Although we don’t have any white, fluffy snow on the ground in Central Wisconsin, there is definitely no doubt in our minds that we have entered the holiday season. With the blockbuster shopping deal ads continuously showing on television and lighted trees slowly appearing in home windows, it has become clear that Christmas is not far away. But before we arrive at Christmas, we have a few other special holidays to get to first, including St. Nicholas Day. On Tuesday night, children will hang out their stockings or leave out their shoes and wake to find what ole St. Nick has left for them. If they have behaved throughout the year, they can expect to find all sorts of goodies like candy, toys and other small gifts, and if they have misbehaved, they will likely find nothing but a lump of coal. St. Nicholas Day is a very common holiday in Europe, but not as well known here in the United States, so it should come as no surprise that many of us use the names, Santa Claus and St. Nicholas interchangeably. But the truth is that these two characters have a lot of key differences between them. Aside from the fact that St. Nicholas was an actual person who lived in the 4th Century, he also gave simple gifts to those in need. According to legend, he encouraged practicing compassion everyday and actually became the model for Santa Claus himself. Here at Lions Pride, we love the idea of St. Nicholas Day because we can relate directly to his message. With the help of our generous donors and supporters, we have the opportunity to give special children the gift of the great outdoors. As you have likely already seen, childhood now is different than childhood at one time. With new and changing technology, children have a lot more entertainment options available such as video games, iPads and other electronic gadgets, they don’t have as much time to appreciate the beauty that lies right outside their front door. Each summer, we’re proud to help bring children with special needs to Lions Camp to help show them the true value of Mother Nature. During their week away, they are able to camp, swim, hike, climb, kayak and enjoy outdoor living at its finest, all while building self-confidence, interdependence, social skills and environmental awareness that will help shape the rest of their childhood. If you’re looking for a one of a kind gift this holiday season, consider making a donation in a loved ones name. (It could also make a great stocking stuffer!) You have the chance to cross a name off your shopping list and show a special child the joy of one of life’s simplest gifts – the wonders of nature at Wisconsin Lions Camp. Keep your gas tank, at least half full, to keep your gas line from freezing. Make sure your tires are properly inflated to produce the best traction, miles per gallon, durability and safety. Avoid using cruise control when driving on icy or snowy roads. Drive slowly and carefully. Everything takes longer on snow-covered roads including accelerating, braking and turning. Leave a little earlier than you normally would to avoid feeling rushed. Watch weather reports before leaving on a long-distance trip. Push back any trips if bad weather is expected, but if you must leave, be sure to tell others the route you are taking, your destination and expected arrival time. Pack a “survival kit” with essential items such as a blanket, a shovel, snack food, first aid kit and more. Hopefully, you will never need to use it, but if you do, you will be happy to have one available. It may be the end of January, but we haven’t seen the end of winter just yet! Lions Pride wishes you a safe remainder of the Wisconsin winter driving season. It may be difficult to think ahead six months when there is snow on the ground, and we need to bundle up before heading outdoors, but it won’t be long until Lions Camp will be back in session! 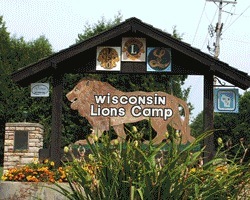 The Wisconsin Lions Camp is the largest project supported by Lions Pride, so there’s no surprise to learn that we spend a majority of the year planning for summertime. We’d like to start out the year by helping our friends recruit staff members for the upcoming camping season. Candidates must be at least 18 years old and be willing to learn and train to work with children with special needs. They have a greater chance of being interviewed if they have experience working with special needs, have a certification in lifeguarding, first aid or other camp skills and are available for the majority of the summer. The program starts on May 27 and goes to August 14, 2014. Most of the staff is hired for the length of the season. Know the right person for the job? Please refer them to the Applications section of the Wisconsin Lions Camp website. There are many resources available to help interested people learn more about the positions. The application is available online, but must be completed and mailed to the Lions Camp office. Thank you in advance for helping us recruit the 2015 Wisconsin Lions Camp Staff. You can contact the Lions Pride office by emailing us at prideoffice@lionspride.org or calling us at 715-677-3000.